The above photo was taken Friday November, 15th 2013 using a cell phone camera. November 19, 2013 Reported in [SpiritDaily.com] from this [blog]. 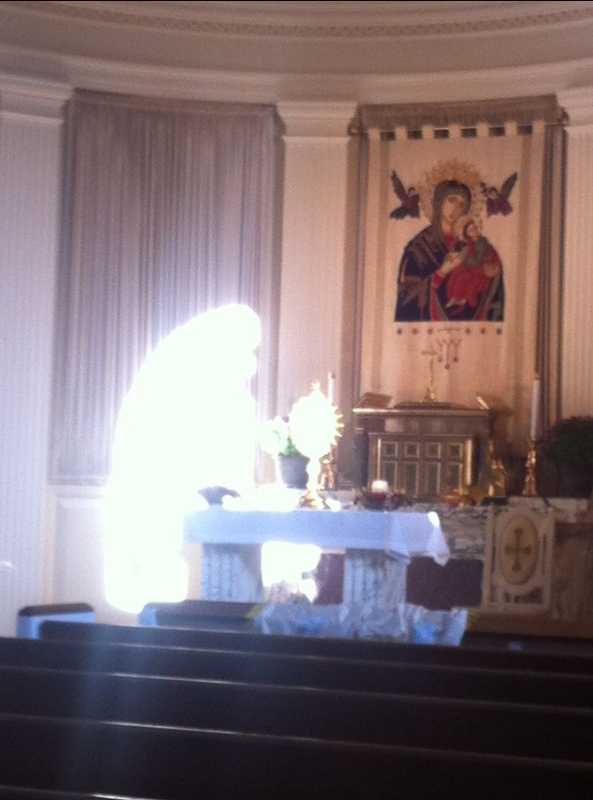 From a friend of a friend, this photo was taken at the Adoration Chapel at Our Lady of Perpetual Help Parish in Glenview, Illinois. Apparently this isn’t the first time that something… unexplained… has happened at this chapel. Look at the pews; the light does not appear to extend to the floor; it’s almost floating. Also, look at how bright the monstrance is — it’s not clear that the monstrance is reflecting the light in the picture; it’s almost as though the monstrance is part of the same light source. Fortunately, it’s well above my pay grade to opine on whether this photograph is truly miraculous, but I do believe in miracles, and I believe in many of the approved Eucharistic Miracles. Just today, my son asked me if priests always believe that the Eucharist is truly the body and blood of our Lord. I told him it doesn’t actually matter if the priest believes. Reality is not determined by belief. It brought to mind the [Eucharistic Miracle of Lanciano, Italy]: In the Eighth Century, a monk of the order of St. Basil experienced serious doubt while saying mass. He asked God to send him a sign that would help him believe in the Real Presence. At the time of consecration, the host turned into live tissue, and the contents of the chalice became fresh blood. The relics were retained, and can still be viewed today if you visit the church in Italy.